I’ve been having fun experimenting with natural cleaning options and, because I have a 10 year old son, wanted something that would work for those ‘in-between days’ for the toilet bowl. I discovered toilet fizzies and let me tell you, not only are they fun for your children to drop into the loo, they are also a great option for freshening it up on those days you don’t have time to do a full scrub. Categories Children, Currently Working On ..., Freebies, Tips & Inspiration! I often get asked how I make the candles at Just Jane, so I decided that it was time to create a video and let you all see just how it all comes together. As a chandler I have candles burning all the time in my home … and I mean all the time! I am constantly testing wick sizes, new fragrances and new containers BUT I NEVER leave them burning in a room where there is no-one to keep a check on them. If that means I have to test an enormous candle in my small home office then so be it. My home, family and pets are worth too much for me to risk losing them to one moment of inattention. I wasn’t always like this though. Yes, in the past I have left candles burning unattended, sometimes overnight! When I think back now I realise just how lucky I was on those occasions. I suspect that one of the reasons I have been so lucky is that even in my foolish days I was always careful about where my candles stood. They were always on protective plates, always away from windows and window dressings, always clear of draughts and usually in the centre of tables or on mantelpieces with no decoration above. Unfortunately it seems though that no matter how often we candle makers stress the safety aspects of burning candles there will always be those who don’t follow our advice. My candles have warning safety labels on the bottom and they all come with a mini card (usually stuck to the lid) with advice on how to enjoy the candle safely. Yet still I read about homes burning down due to candles being left unattended or too close to highly flammable materials. Categories Candles, General, Hints, Tips & Inspiration! During the final week of 2013 whilst I was reviewing my year for both business and personal life, and preparing for planning for 2014, I came across this fantastic idea. Simply put, it consists of a jar into which you place notes about the things that have been good as you go through the year. Then at the end of the year you open up the jar and read through the notes. It’s so easy to forget all the good things that happen as you move on through each day of your life and this is a great tool to help you remember and put a smile on your face. I envisage using the jar throughout the year on those days when I’m feeling a bit down or when my business is not moving along as I think I want it to. I think it is a great way to help refocus on the things that matter. This year I took some time out to ‘really’ think about how the year had gone for my little business Just Jane. I thought about the things that had gone wrong, but also about the things that went well. I took some time to go back through my e-mails and Facebook pages and read through the messages and comments there. I looked back at my photos and blog posts (there weren’t many of them!) and took a few moments to view them as a stranger might. It was an enlightening experience and really helped to give some clarity to my plans for 2014. 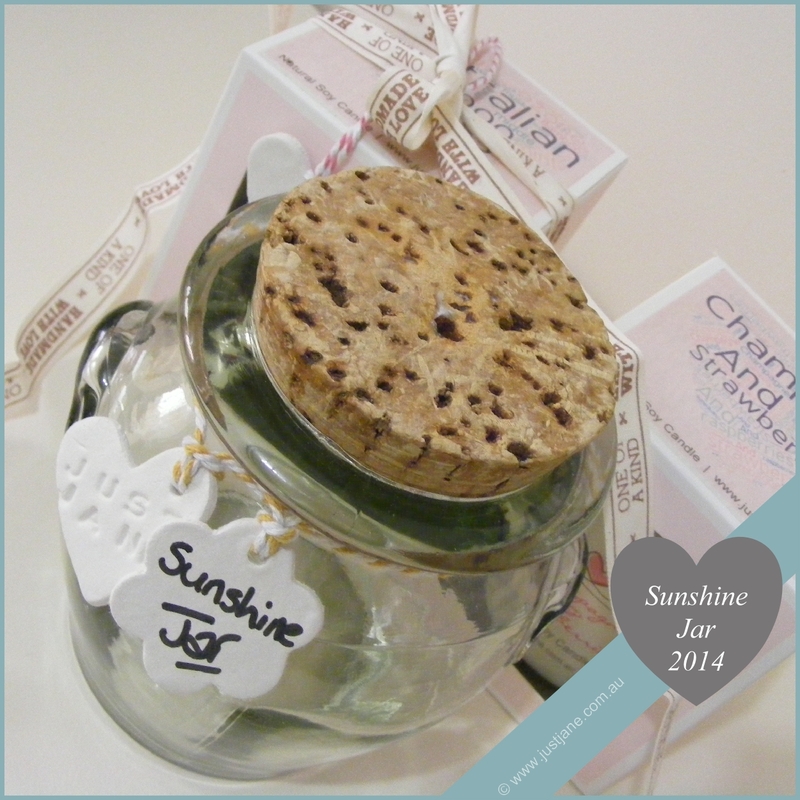 Fill a jar with happy notes throughout the year! I found this jar (and several others) a couple of years ago in my local Salvation Army store. Since then it has been a candle several times – and has always drawn positive remarks! – but it now has a suspicious looking hairline crack near the top and I’m afraid that the heat from a candle flame may cause it to crack completely. This is a great opportunity to keep it in my life and give it another happy purpose. Happy New Year! May 2014 bring you everything you wish for! Categories General, Hints, Tips & Inspiration! Surprisingly, maybe, one of the most frequent questions I get asked as a maker of soy candles is how to clean the jar when the candle has burned out. I think this is because many of the shop bought candles around are made of a paraffin based wax blend that has a high melt point, is very hard in texture and therefore is difficult to clean up. I can remember trying all sorts to clean out pretty jars in the past. Categories Candles, Hints, Tips & Inspiration!